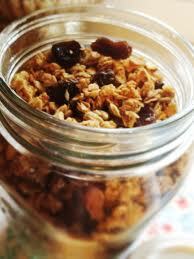 Granola is really easy to make. My daughters love this recipe. Feel free to vary it any way you want. You can't go wrong. 2. In a large bowl, combine the oats, wheat germ, brown sugar, cinnamon, and salt. 3. In a separate bowl, whisk together the maple syrup, oil, and water. 4. Combine the dry ingredients and wet ingredients. 5. Spread onto a foil-lined baking sheet and bake for 10 minutes. Remove from oven, sprinkle the almonds on tip, and stir well. 5. Bake another 10 minutes. Remove from oven and stir again. 6. Bake for another 5 minutes and remove from oven and let cool. 7. Stir in the toasted coconut and raisins. Store in an airtight glass container. Will keep for 2 weeks maybe longer. 2. Sprinkle coconut over foil lined baking sheet.. Bake for 5 minutes, then gently toss and stir the coconut. 3. Check every minute from this point on tossing and stirring every minute. Coconut will burn very quickly. It will continue to cook when you remove the pan from the oven. I toast my coconut just until it is light golden color. There may still be some white shavings of coconut mixed in. That's OK.. Try this recipe with Homemade Almond Milk. Yummy.